Falvey Memorial Library :: Announcing the 2017 Falvey Scholars! Announcing the 2017 Falvey Scholars! Falvey Scholars is an annual program that recognizes outstanding undergraduate research at Villanova University. It is a collaborative initiative of the Library and the Center for Undergraduate Research and Fellowships. Winners of the Falvey Scholar award are selected from a pool of candidates that is generated by applications submitted by a senior Villanova University student or a group of students working on a senior project together with the recommendation of the advisor to the senior thesis or capstone project completed for academic credit. We are proud to announce that the following students have been selected as our 2017 award winners: Stephen Purcell, Anna Briker, Danielle Sens-Castet, Emma Max, Kathleen Boyce and Ryan Zalla. Each winning student will give a short presentation on the content and findings of the research involved in the writing of their thesis or creation of their project report at an event on Friday, April 28 from 9 a.m.-12:30 p.m. in room 205 of Falvey Memorial Library. This event is free and open to the public. 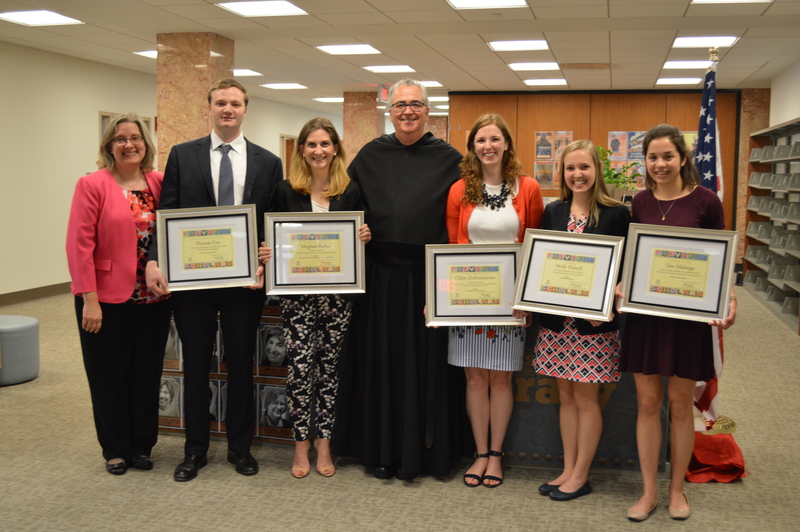 The 2016 Falvey Scholars pictured with University President, the Rev. Peter M. Donohue, OSA, PhD.